High definition artwork printed on high-quality canvas for wall decor, home decorations or office decorations. This stunning wall art will become the centerpiece of your home in no time. We use the advanced and most excellent canvas printing technology that makes our product eye-catching and sturdy. If there is a problem with your order, be sure to contact us. Believe that we can make you satisfied through our efforts. We hope it is not only a transaction, but also make your life better. If you want us to print your photos, please contact us freely. We will reply within 12hrs. Already packed with wooden frame and ready to hang on the wall. U.S: Free delivery within 2-3 Business days. (Please allow an additional 3-5 business days of processing due to an extremely high order volume.) Orders during the Christmas Holidays will be shipped immediately after the holidays. All of our artwork is made to order. We do not carry an inventory of products. Yes. Our artwork comes with a pre-installed sawtooth hanger and hanging instructions. Most of the canvas arts are made to be hung indoors. Though you can still hang your artwork outside only if it's a shaded area as moisture, water exposure, and/or direct sunlight will ultimately damage the artwork over time. Can I buy a digital copy of the image? We are unable to offer any digital copies for sale. Will the colors I see on my monitor be exactly how the image prints? The colors you see on your monitor may be close to what is printed, but due to differences in the color calibration of monitors, a perfect match cannot be guaranteed. Are these strict canvases or are they shipped already framed? All our framed canvas wall art are shipped framed, stretch on board. Can you create custom sizes? 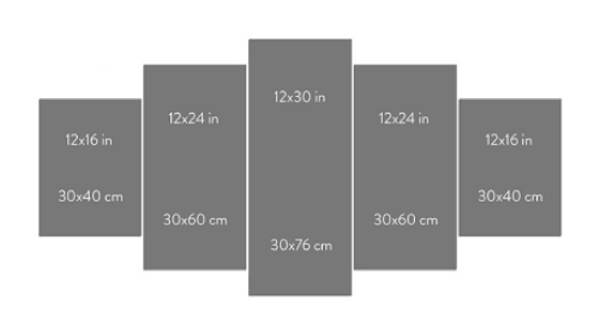 I have a big wall and would like it to be about 100 inches wide? Sure we do! Please contact us through email or send us a message on our chat support system. If you have any questions about the items after you receive it, please contact us first. Do not open a dispute on Paypal, you will be satisfied with our answer and customers service. Only damaged, misrepresented items are subject to return. Please email us immediately before returning items (in the same condition as it was sent to you). We will do a new painting for you and send it to your door.